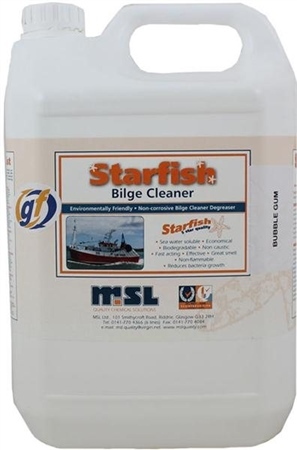 Starfish is a specially formulated non-corrosive bilge cleaner degreaser, with a pleasant bubble gum smell. Directions/Applications: Starfish can be diluted with up to 200 parts water depending on the level of soiling. Starfish can be introduced directly into the bilge and will act as an emulsifying detergent to help maintain cleanliness of the bilge. Starfish can also be used as a degreaser by dipping, spraying or brushing the soiled area. Agitate if necessary before rinsing off with clean water.